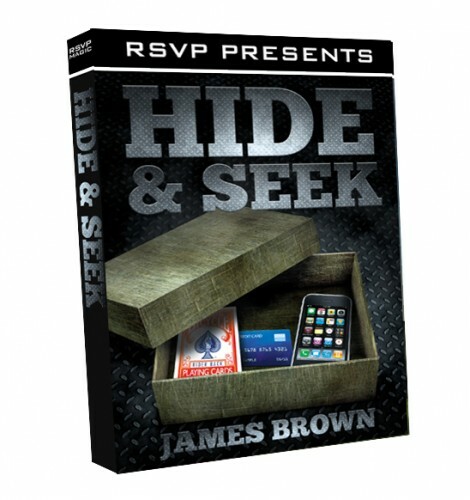 Описание:ТрейлерWelcome to James Brown's 'Hide & Seek', a superb collection of routines using James' version of an old Pat Page idea. Playing Cards, Credit Cards, Books and Phones are all used in a series of superb magic effects that will blow your audience's minds.Best of all NO GIMMICK OR DEVICE IS USED TO ACCOMPLISH ANY OF THE ROUTINES!Contents include:Teleport - James latest 'go to' routine using a borrowed credit card and phone. Using the latest 'app' make their credit card vanish INTO their phone and then teleport it to your jacket pocket, inside your wallet. Now take the credit card and make their phone teleport instantly back into the wallet. Stunning and fast magic at it's finest.Credit Card to Cash - A borrowed Credit Card VISIBLY changes into a bank note and then appears INSTANTLY inside your jacket pocket. Instant magic.The Ultimate Book Test - Any book. Yes, ANY BOOK is borrowed and a word FREELY chosen by the spectator. The magician now predicts the THOUGHT of word, written on a business card. Impressive stuff, but now for the kicker finish. He removes his wallet from his jacket and explains that he even knew the title of the book before it was chosen. Inside his wallet, inside a sealed envelope is a card with the book name written on it! ANY BOOK, ANY WORD, ANYWHERE!Perfect Poker - A card is thought of and the magician now asks the spectator to think of his perfect poker hand using that THOUGHT OF CARD (No force). The magician now tells the spectator the name of their card and then gives a kicker finish by producing the the entire THOUGHT OF POKER HAND from his jacket, inside his wallet! Brilliant.No Palm Phone to Wallet - Borrow a phone, give them your wallet to hold and then take their phone and instantly vanish it! Remember they hold the wallet before their phone vanishes and yet when their number is dialled, their phone is ringing INSIDE THE WALLET, THEY'VE BEEN HOLDING! A real reputation maker.Red Heat - The perfect Chicago Opener style routine using a thought if card.Thought of Card Transpo - A THOUGHT OF CARD is named and a credit card borrowed. Visually the credit card changes into their thought of card and then instantly appears INSIDE THE MAGICIANS WALLET. No Palming and easy to do.